1. 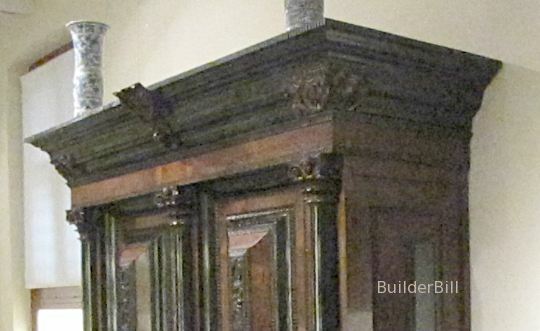 )A moulded board, often quite large and ornate that is fixed to cover the internal walls to ceiling joints.2. )A moulding serving as the finishing member of a structure. In the original sense of the term the crown mould can be any moulding that sits atop or terminates a structure, and like a lot of the moulds used by woodworkers it can just as easily be used to refer to masonry moulds. Moulds like the one above are very ornate and furniture manufacturers used many varieties to finish the tops of cabinets. It is not too hard to see that the people that were making and using these moulds went the step farther and used them in their modern context of being a mould to cover the wall to ceiling joint. It is easy to see that these moulds will require very accurate cutting. The method that has been used for centuries is to use a home made mitre box and a hand saw. At the right is a moulding set up in position to the wall and ceiling and at the right the position it takes in the mitre box.